Lisa and I have been on a roll lately, running through at least one game a night for a few weeks now. We’ve been dusting off oldies but goodies that haven’t seen the table in months (years?) and having a lot of fun rediscovering the gems that we’ve enjoyed in the past but just haven’t taken the time to enjoy recently. Playing games together as a couple helps bring us closer rather than each of us doing our own things separately every night. Go grab a game and challenge your spouse or significant other to some friendly competition; you won’t regret it. 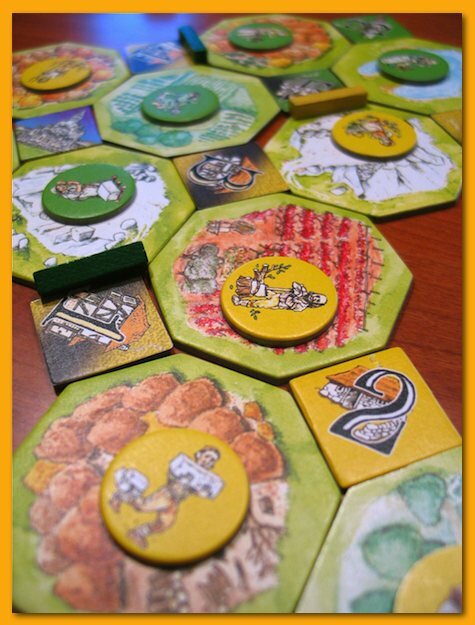 Alea Iacta Est – We played a two-player game and then another, each playing as two players. 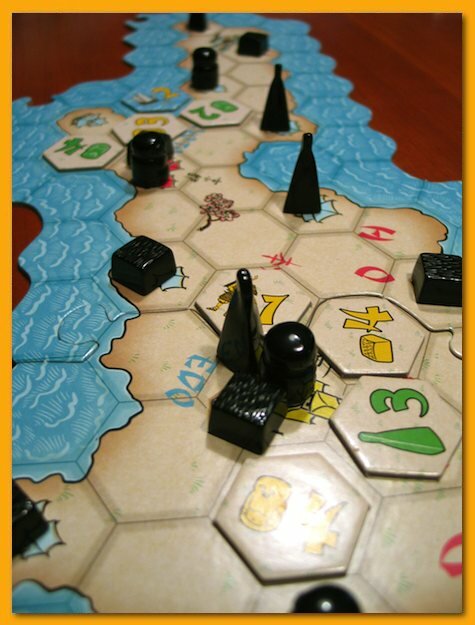 Samurai – Last time out of the box…years ago but an excellent game no matter how many players you have. Glen More – Great with two! Keythedral – Looks great but better with more than two. Okay with two but wow, that initial tile placement is crucial. 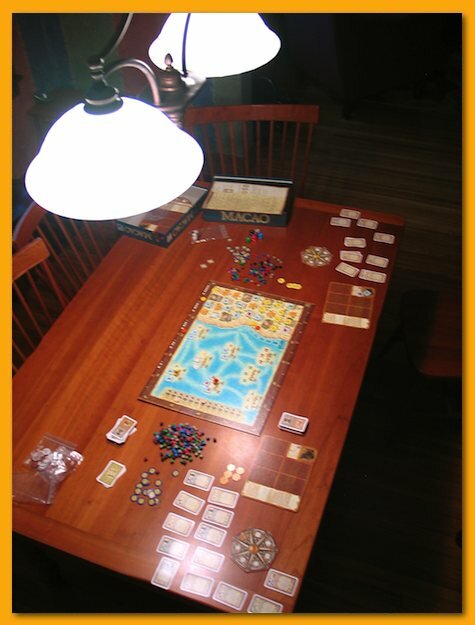 Macao – One of our favorites but last night’s game, the dice were brutal to both of us…mind the gaps in the wind rose! 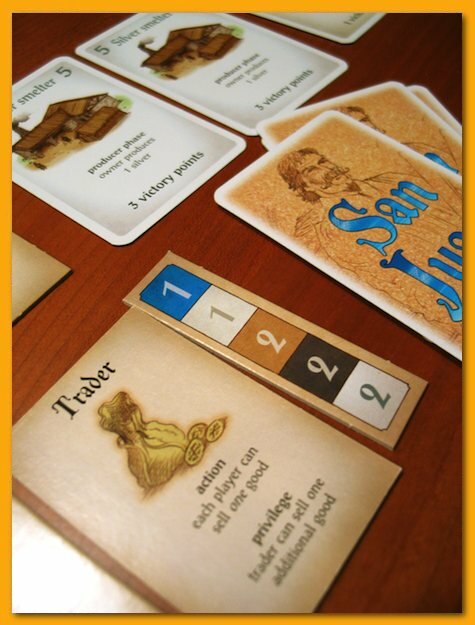 San Juan – I even had trouble finding this one on my game shelves but I’d forgotten how much fun it is. 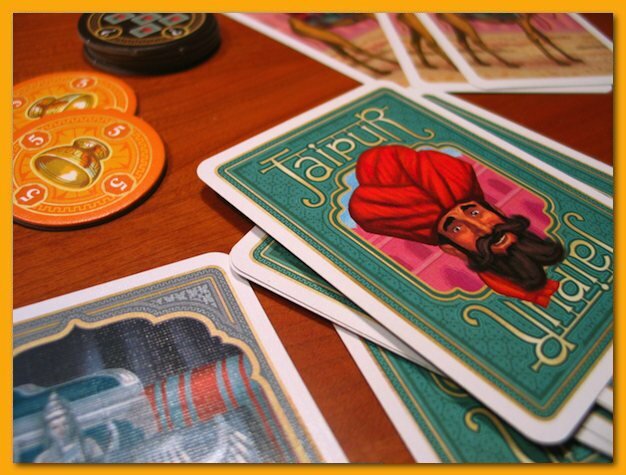 In looking for San Juan I found Jaipur tucked in behind some other games. I hesitated pulling it out (not really) because Lisa is really good at it but I gotta take my lumps (besides she gets a kick out my grumbling about my crappy card choices! 🙂 ). 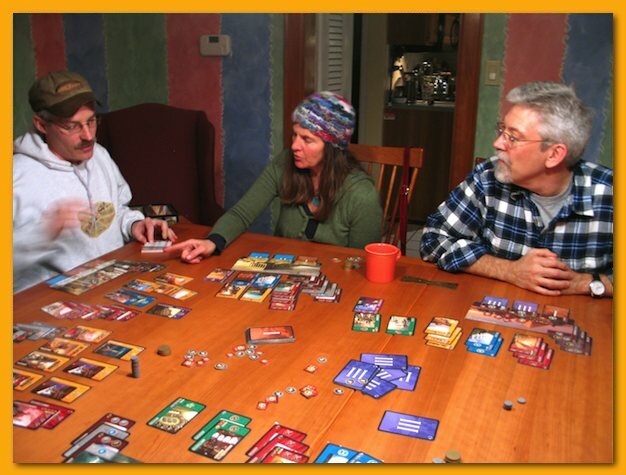 Once a month, on a Saturday evening, Lisa and I gather a few friends for some light games and good food. 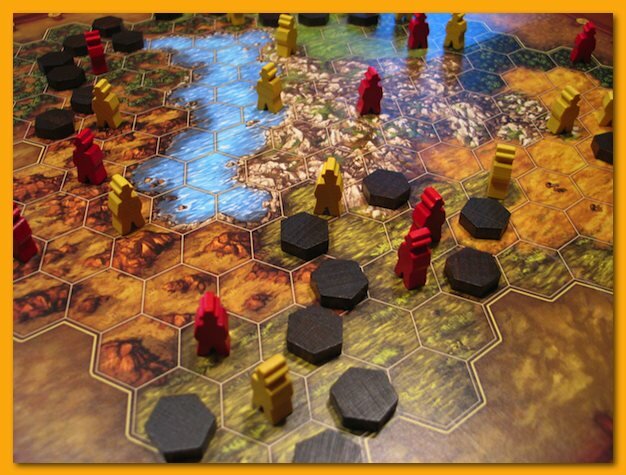 However, for the most part, the board games simply provide a nice backdrop for some enjoyable face-time with real people, a thing that seems to have gone by the wayside in recent years. 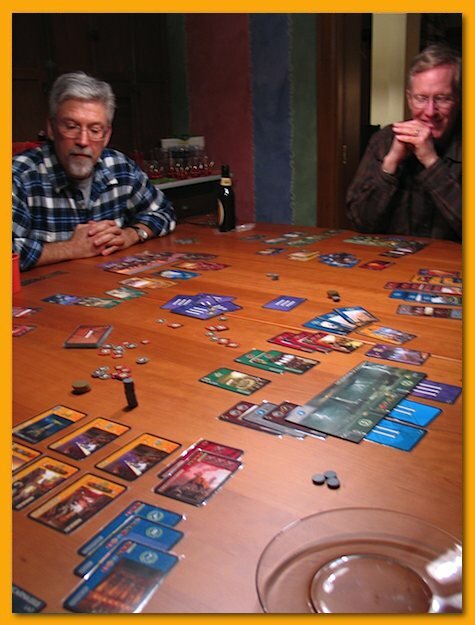 For several years, we’ve been hosting a monthly game night and even with our modern busy schedules, we’ve been able to find a quorum from those fifteen people to gather for a game or two. There are times when we’ve had enough to split into two tables but that’s rare. Although Lisa is still recuperating from an illness, she felt that her recovery had progressed to the point that we decided to jump start the group again after canceling a few months. We ended up with seven last night so we grabbed 7-Wonders so that we could all stick together for the first game. Five of us were already familiar with the game so we ran through the rules for one of the couples. It’s nice when other people who outwardly proclaim they are not gamers lean in to help new players through tough decisions or for rule clarifications. And they don’t call themselves gamers; well I beg to differ! 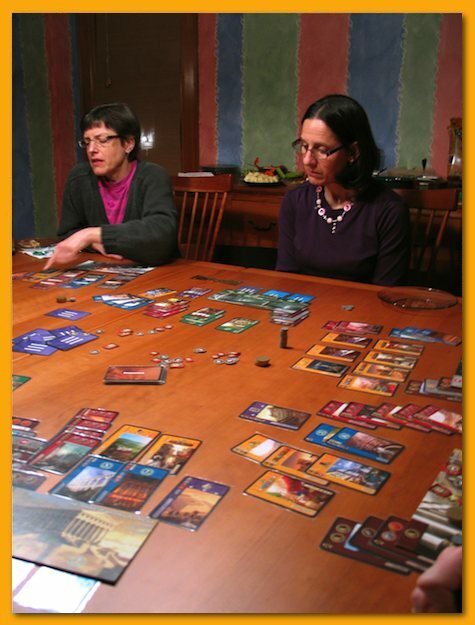 7-Wonders is one of those odd games that it takes a while to get through the rules: what different cards do, how you score points, how you build resources to have enough of them to build cards in the future, how the “free” building works when you’ve built the appropriate predecessors, etc. But in the end, if you play it once, odds are, you’ll like it. I’ve yet to see anybody (even people who say they don’t even like games) not get it. Many new players (and old for that matter) want to play it again immediately afterward. The great thing about the game is that it plays in roughly the same amount of time (about 30-45 minutes) regardless of the number of players you have. The game is family accessible; you can easily have younger kids pair up with adults to help make partner-based decisions. There is one expansion already out and another due this summer that officially introduces partnership play. I’m really looking forward to it. We spent a lot of time after the game just hanging out, talking about kids, costs of colleges, etc. and generally had a nice evening sitting around the table chatting. After one couple left, I pulled out China and with the five that remained we quickly ran through the rules and got started. 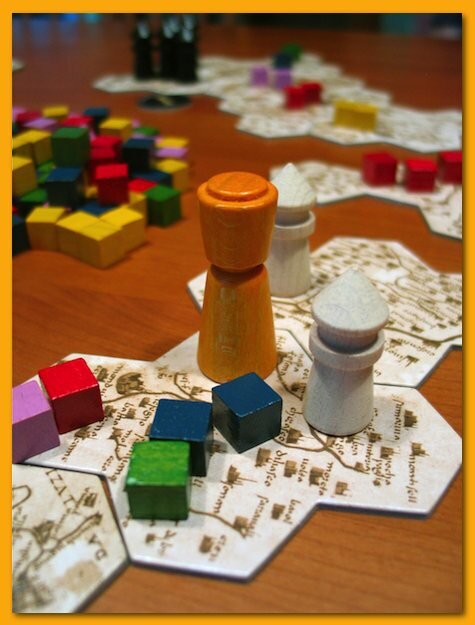 China is a really great game by Michael Schacht. If you’ve not played it you really need to pick up a copy if you can find it. 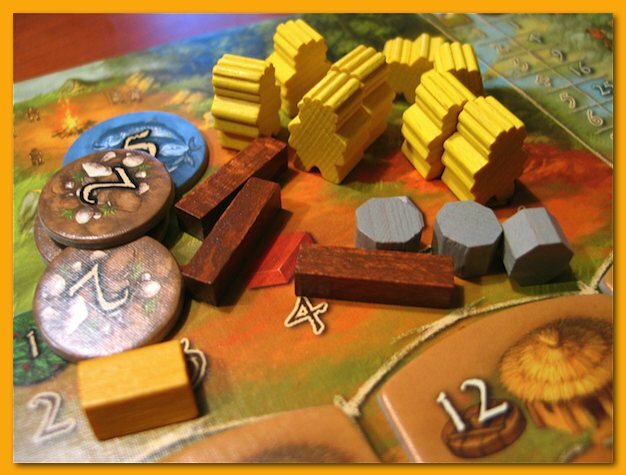 China is another game that plays well with several different numbers of players (the double sided-board provides different maps depending on the number of players) and like 7-Wonders, you can play it and be boxing it back up in less than 45 minutes, an amazing feat given the depth of the game in such a simple package. Lisa survived the ordeal without any long term physical issues so we’re both glad she’s on the mend and ready to do it again next month. Now, I’m off to pick out a game for the two of us to play later this afternoon. My wife and I are fans of the television program Mad Men and when I told her that Rich Sommer (Harry Crane on the show) was a board gamer and has more games in his collection than mine (currently about 225), she said, “I always knew there was something strange about him.” :-)The folks setting up BGG.con in November are working through the arrangements for Rich to attend (agents, money, etc. ) 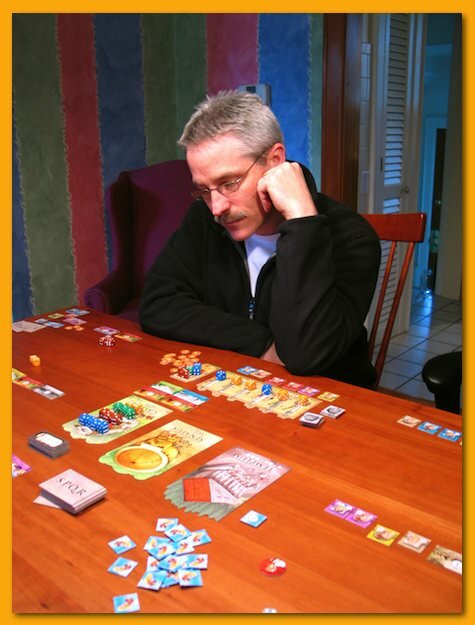 but in addition to sharing the news on BGG, they linked to several of his “Game Night With Rich Sommer” videos. They’re worth a look. My wife has been recuperating from some medical issues recently but she’s been well enough and getting better every day to want to play games most every night. I thought I’d spend a few minutes annotating a few photos I’ve taken over the last week or so. Enjoy. 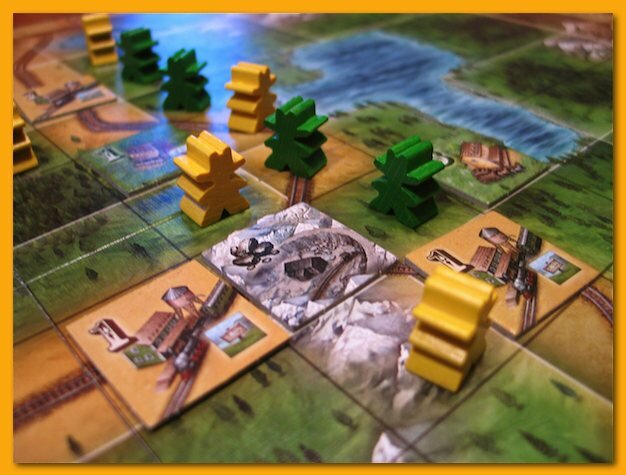 Lisa and I like Oregon but like many games, it’s been awhile since it’s seen the table. It’s easy and quick to play. Sometimes you feel forced to make the best of bad cards but it has proven to be a good activity for us to spend some time together without too much heavy lifting. 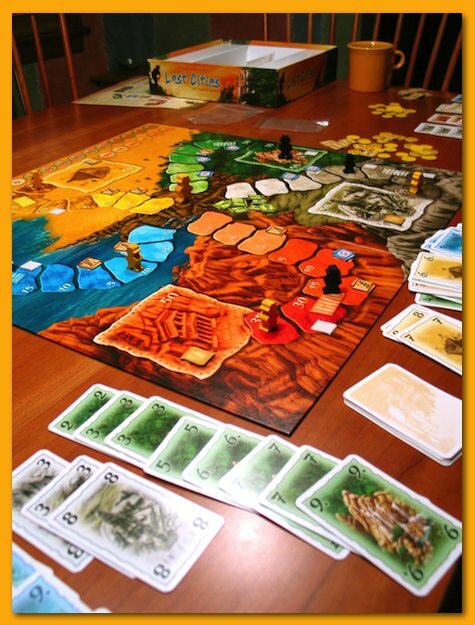 She mentioned Stone Age so we dusted it off and gave it a go. In the past, we’d played the heck out of it the first few months we had it but it has been a long time since it’s seen the table. It does play a bit mechanically once you get the hang of it but we were both glad to have let it out to see the light of day again. 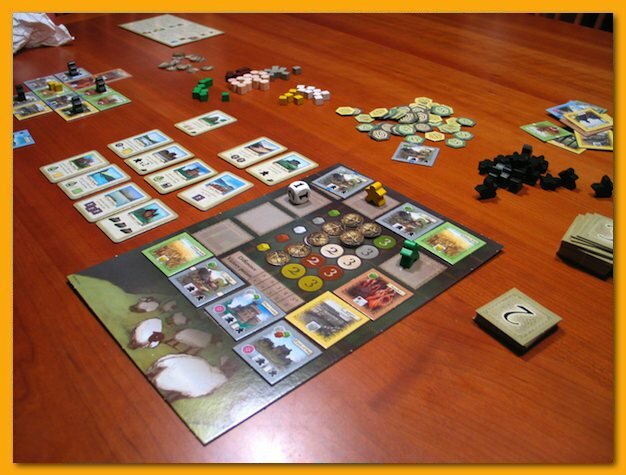 Next up we played three or four games of Kingdom Builder. We even played one game with the same set of boards and only shuffled the cards to see how differently it played. Lisa won the first game handily and I felt trapped in a corner. The second game I won by a decent margin so, at least in that board set up, the cards can make a huge difference. There’s not much heavy lifting in Kingdom Builder but Lisa really likes it for a nice activity to pass the time on a lazy evening. 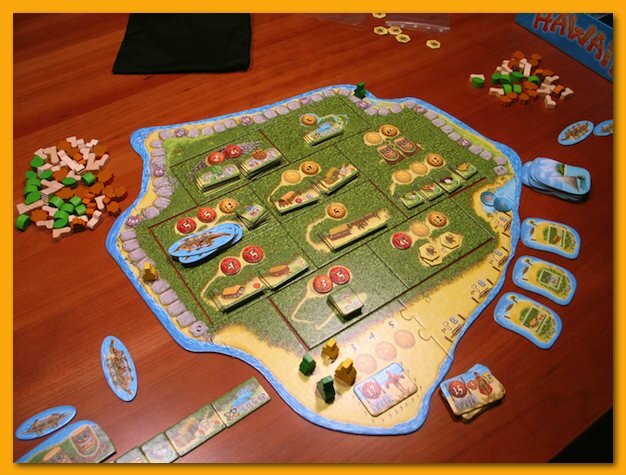 When Lisa felt up to learning a brand new game, I pulled out Hawaii intending only to introduce her to the game but with only two, we quickly finished and she said she liked it but could see that it would be completely different with more players. With two, it’s relatively easy to purchase the stuff you want but with more players, the goods are scarce! Cool “feet-ples”. 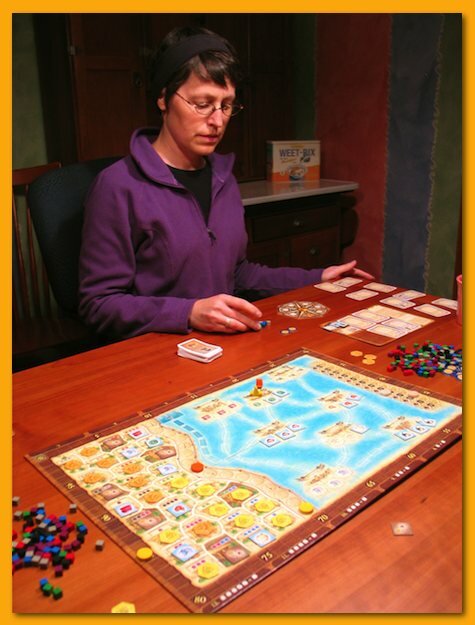 I pulled out Terra Nova, a game I got for free a couple of years ago but had never played, and after only a few moves, Lisa was ready to pack it up. She’s not one to like abstract thinky games. Players start with all their “guys” on the board and then move them around reminiscent of the Hey! That’s My Fish! 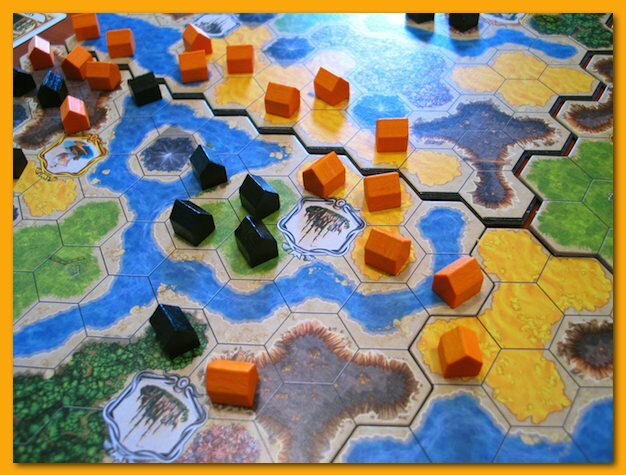 mechanic but instead of pulling tiles up you wall off territory and in an area majority game mechanic earn points. She really didn’t like it and felt that every move she made would make her feel silly when the next player (me!) took advantage of a weakness of position. Too “chessy” she called it. 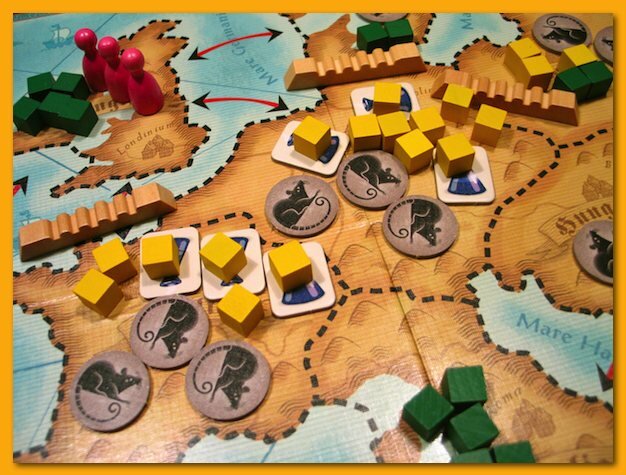 Tonight we pulled out Rattus with the Pied Piper expansion. Rattus works much better with more players and we played with the incorrect rules for the Soldier making the Nun card too powerful. Lisa took great advantage of that but could feel that something was amiss. Still, we had a good time. Lisa was ready to play another game back to back so it’s a winner and a keeper.